Among the many changes that take place almost every month in the Play Store, Google has decided to add a new one: permanently closing the Top Developer program that for years has allowed some developers to have a recognition badge in their applications. With a simple email, Google announces the closure of this initiative within 30 days with the elimination of such visual indication used up to now. Reading the e-mailed (and you can read it at the end of the article), the search giant wants to change the focus of individual applications, rewarding the software, not the developers. It is not important that the developer has top apps, so to speak. 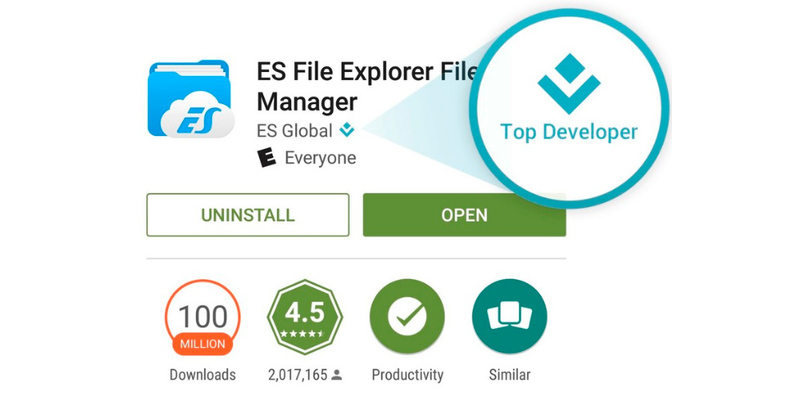 However, the truth is that for several years the purpose of this program was to highlight the ability of a developer or a software company that have achieved great success in the Play Store, granting a special logo called "Top Developer". Everything we add next could be translated into something more exciting that is about to hit the Play Store. The closing and removal of these badges will take place within the next 30 days. But at the same time Google has said in the email sent to developers that something new and equally interesting is in the planning stage. Therefore, this radical change is to provide small weekly changes for developers and they will be tested by a small group of users. «The Google Play Top Developer program was created to recognize partners who developed top quality Android apps and games Every day developers like you are hard at work creating apps and games on Android. Whether you’re updating an existing app or building something new, we’ve seen an incredible increase in the level of polish and quality in so many fun, entertaining, and useful apps. We want to make sure more people find the great experiences you are creating. The Google Play Top Developer program launched many years ago to recognize developers who created high quality Android apps and games. We conducted research, with both developers and consumers, and observed a clear value and preference for the recognition of individual apps and games, instead of entire organizations. After taking a look at our existing app recognition programs, the Google Play editorial team has decided to focus its efforts on recognizing high quality and innovative apps and games.